An article from the Dorset Echo reproduced by kind permission of the editor. LADY in Red by Chris de Burgh - for me, possibly one of the worst songs ever recorded....and I’m introducing it live on the radio. 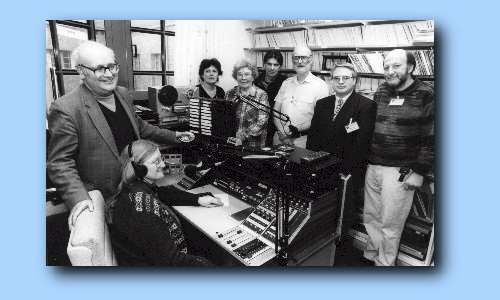 But this is no ordinary broadcast or run-of-the-mill station, it’s the request show on Ridgeway Radio. And DJs on the County Hospital radio station in Dorchester will play whatever it takes to help patients on the road to recovery. “We get requests for all sorts of weird and wonderful tunes but they all mean something to someone - that is why they are so important,” says Andy Worth, the station’s chairman. On the night I sit in as a guest on the Wednesday night slot, the play list includes housewives’ favourites Robson and Jerome, seventies rock giants Lynyrd Skynrd and Michael Ball. The Salvation Army Brass Band, Irish superstars U2, Oasis and, of course,Sir Cliff also rub shoulders in the star studded show. Dorchester penshioner Gwen Wills goes round collecting song slips off patients beforehand and lends her voice when the on-air light flashes red and the broadcast goes live. Nearly every bed in the hospital is hooked up to Ridgeway and more than 1000 could be tuning in at any one time. The station’s name is taken from the Ridgeway Hill as a symbolic link of the merger of the two hospitals in Weymouth and Dorchester as Dorset County Hospital last November. It used to be called West Dorset Hospital Radio but now includes many members of the sadly defunct Radio Shambles at the old Weymouth and District Hospital. Gwen, who has presented the Sunday Lunch Box on the ill-fated BBC Dorset FM, fails to be phased by the job of establishing the new station and clearly loves her job. “I like people and I like talking but the most important part is the listening,” she says. “It is just as important to listen to the patients as you go round the wards collecting the requests as it is to broadcast.” Gwen wishes she had more time to join the new Ridgeway service aimed at tuning the radio in with patients, rather than vice-versa. The ‘ambassador’ project promises to draw together a band of Ridgeway based volunteers to tour wards, collect requests, talk to patients, offer information and form a bond between staff, patients, visitors and public. The pioneering scheme is the brainchild of ambassador organiser Sue Worth. “You quite often come across people who need someone to talk to,” she explains. “The team of volunteers will go round the wards chatting to people and help the radio keep in touch with patients. “We are hoping for a reasonably big group and would welcome anyone who is interested. Good talkers, with life skills would be ideal. It could appeal to those who have taken early retirement. ”The ambassador project reflects Ridgeway’s philosophy of using communication between staff, patients and visitors to forge a sense of identity and community at the hospital. The studio is packed with hi-tech equipment, CD players, record decks, mini-disc systems, computer databases, a huge sound desk....not to mention more than 7,000 records and CDs. From this nerve centre the Ridgeway team broadcast an eclectic mix of programmes, including Sound Choice, Town and Country News, Talking magazine, In The Countryside, Mid-Day Menu, Ridgeway Billboard, Sixties Sounds and North, South, East and West. Outside broadcasts are eiher live or recorded and include football commentaries, concerts and Dorchester carnival. Heather has just recorded the grand opening of the hospital’s new cafe by the Friends of Dorchester Hospitals, which is also the station’s main supporter. The station’s sound desk, a bewildering bank of switches and controls, dominates the studio and was bought from Bournemouth University for a knockdown £100. Ffamous radio names such as David Hamilton and Steve Wright launched their careers on this desk, according to Andy Worth. Andy says Ridgeway is looking for more volunteers to help boost the station’s ever-growing role. Ridgeway Radio seems destined to become one of the new hospital’s great success stories. It has been asked to cover the Queen’s official visit at the start of May and already has its own website on the Interent, thanks to Andy Venton. The team hope to lauch a 24 hour service with early hours shows to help those who can’t sleep. “It’s the only time we want people to fall asleep when they are listening to us,” joked Andy. Telephone 01305 254227 or write to Ridgeway Radio, Room 200, Dorset County Hospital, Williams Avenue, Dorchester.